Joe Cockers Grease Band and many more guest artists. For the very first time Movie Soundtrack scores from Horror movies and Serials of the 30's and 40's, plus classic 50's T.V. series, are recorded with rock instruments instead of full orchestras. Zip Caplan and his Cast of Thousands keeps the essence and mood of the originals while adding the sound and feel of Rock, Blues, Funk and Latino. Prepare yourself to experience an all-new way of listening to the music of some of the finest film composers of the 20th Century, including Max Steiner, Franz Waxman, Hans J. Salter and Lalo Schifrin. 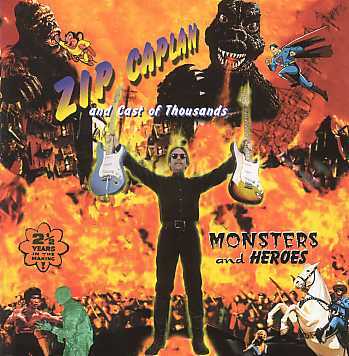 Zip Caplan is the longtime lead guitarist for The Litter, the Minneapolis cult garage band often referred to as ".....the forerunners of the Punk Rock Movement" and who also recorded the cult classic "Action Woman"(represented on the Nuggets box set from Rhino). For a time in the 70's Zip headed up the group White Lightning, did studio work in Los Angeles and later played a short stint with Johnny Winter. Zip Caplan is joined on this project by an old friend, Bernie Bomberg, who plays Keyboards on all the tracks in addition to acting as co-producer and arranger. Zip's association with Bernie began back in the early 60's when they first worked out a crude version of The Mummy. This short version was later re-worked and used on the highly collectable first Litter album "Distortions". In the 70's Zip took another arrangement from his early collaborations with Bernie and turned it into a showstopper with the group White Lightning. The William Tell Overture became so popular at White Lightning concerts that it literally brought the house down at the Aragon Ballroom in Chicago when White Lightning played a double bill with Jethro Tull. Both pieces (The Mummy in its full version for the first time) appear on the Monsters and Heroes CD along with all the other great themes that impressed a young Zip Caplan as he watched the Adventures of Superman for the first time on his parents 1955 black and white 13" T.V. set. Anyone who remembers the classic monsters and heroes will find themselves ".....returning to those thrilling days of yesteryear" and for those that are new to this music the thrills are just beginning.